On August 5 we posted news of the upcoming Ninth Annual Hawaii International Conference on Education. Go to the link here. This morning we received news that the submission/proposal deadline originally set at August 14 has been extended to September 8, 2010. Today's mail brought news of a podcast update from the Gilder Lehrman Institute in New York. Since 1996, the Gilder Lehrman Institute has presented eminent historians discussing major topics in American history. Now you can hear these lectures on your computer or on a portable media player. The Institute's archive of more than eighty podcasts is available for free, simply by registering and signing in on its website. Go to this link for a full list of available podcasts. "War Between Neighbors: The Coming of the Civil War"
Edward Ayers, President of the University of Richmond, discusses his prize-winning book, In the Presence of Mine Enemies: War in the Heart of America, 1859-1863. Based on an archive of documents that Ayers collected from two counties, one in Virginia and one in Pennsylvania, he explores the way that sectionalism grew in these communities before and during the Civil War. Richard Brookhiser, senior editor at National Review, discusses his book, Alexander Hamilton, American. Brookhiser explores Hamilton's life and work, particularly his contributions to the financial system of the United States. "Occasionally, professional development opportunities will come to NCHE's attention that we believe will be of value to our members. The National Humanities Center, planned under the auspices of the American Academy of Arts and Sciences, began operation in North Carolina in 1978. NHC is an independent institute whose goal is to promote the teaching, scholarship, and public understanding of the humanities. It has a regular calendar of Professional Development opportunities specifically designed for American history and literature teachers." Indeed, in the past we've featured news of such offerings from the National Humanities Center. We highly recommend these low-cost educational opportunities. Go to this link for a list of offerings and other details. Sophia Li reports in the Chronicle for Higher Education that a "new player entered the field of open online education last week: Nixty, a Web site that allows any user to take and create courses for free." "On behalf of Hawaii Sons of the Civil War Memorial Committee, we would like to cordially invite to you to attend the dedication ceremony of a monument to honor those from the Kingdom of Hawaii who volunteered to serve in the American Civil War in the Armies and Navies of the Union and the Confederacy as well as the veterans of the Civil War who made Hawaii their home after the war. Currently no such memorial to their sacrifice exists. It will be a place for future generations to remember and memorialize those from Hawaii who served and sacrificed in the Civil War as well as help preserve part of our American and Hawaiian heritage." The ceremony will take place near the lookout at the National Cemetery of the Pacific (Punchbowl). August 26th also marks the 149th anniversary of the date that the Kingdom of Hawaii, under King Kamehameha IV, declared its official neutrality in the conflict. In addition to remarks by Hawaii Pacific University Professor Justin Vance and Hawaiian History researcher Nanette Napoleon, the proceedings will feature a patriotic music performance by the Royal Hawaiian Band, a rifle salute by Civil War Re-enactors, and Taps played by a U.S. Navy Pacific Fleet Bugler. Dr. Justin Vance, President, HCWRT;Assistant Professor of History, Hawai‘i Pacific University; Hawai‘i Sons of the Civil War Memorial Committee. Kino‘ole Spieler: Henry Ho‘olulu Pitman, Pvt., 22nd Mass. Volunteer Inf. 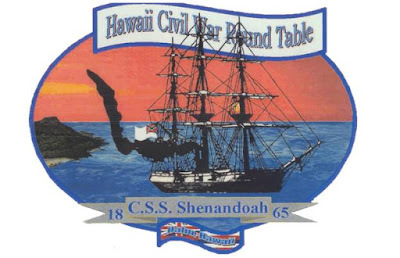 The History Education Council of Hawaii has received news that the Hawaii Civil War Round Table will meet next Tuesday, August 10, 6:00 p.m., at the USS Bowfin Museum. The speaker will be the esteemed History Department Chair at North Texas University, Visiting Professor at Hawaii Pacific University, and Civil War Scholar Dr. Richard McCaslin. Starting at 6:30 p.m., Dr. McCaslin will give a talk related to his book: The Last Stronghold: The Campaign for Fort Fisher (Abilene, TX: Grady McWhiney Research Foundation, 2003). "Pupus: bring em if you got em." Please use the main entrance since there is construction at the back entrance. Parking is free and the public is welcome. A Call for Papers for the the Ninth Annual Hawaii International Conference on Education has been announced. The conference is scheduled from January 4 to January 7, 2011 at the Hilton Hawaiian Village Beach Resort & Spa in Waikiki. The conference is co-sponsored by Pepperdine University - Graduate School of Education and Psychology; University of Louisville - Center for Sustainable Urban Neighborhoods; New Horizons in Education - The Journal of Education; Hong Kong Teachers' Association; and the California State University, East Bay - Educational Leadership Program. This conference provides for academicians and professionals from education-related fields to interact with members inside and outside their specialty disciplines. Cross-disciplinary submissions with other fields are welcomed. We only learned today that the submission deadline for proposals is August 14, 2010. Go to this link designated for submissions. Good luck to all! "Furlough Fridays behind them, more than 171,000 public school students head back to school this week to face new challenges as No Child Left Behind proficiency goals rise, the race kicks off to keep more schools from facing federal sanctions and teachers begin major curriculum shifts to follow national standards. "Educators say they will need all the classroom time they can get to meet the higher goals. "And they are looking forward to no longer having to teach around furlough days, which forced them last year to cram lessons into shorter periods, scale back on other activities, like art instruction or review lessons after long weekends." Click this link to read the entire story by Mary Vorsino. The Winnick Family Foundation generously provides funding for transportation grant opportunities to certified classroom teachers nationwide of grades 4-12 in U.S. public and non-public schools that have a low-income student enrollment greater than 30 percent. These grants can help put eligible schools on the road to the Abraham Lincoln Presidential Library and Museum where visitors are immersed in Lincoln's world and time through scholarship and showmanship. Another grant opportunity is generously funded by Midwest Generation, an Edison International Company, to Illinois teachers of grades 4-12 in public and non-public schools that have a low-income student enrollment greater than 30 percent. This grant is also available to not-for-profit youth organizations serving the same population.